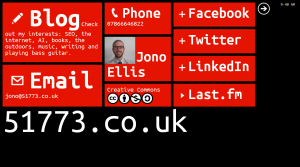 My own webstite has seen a few evolutions over the years - the current evolution is based on the Metro theme from the Windows 7 Phone... right down to the clock in the top right! 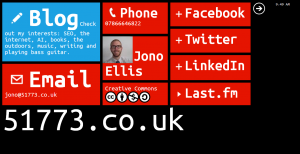 It was a fun design to play around with, especicially to make big touchable buttons - hopefully it makes all of my main contact details easy to access! Fun fact: 51773 is my surname "Ellis" spelled out in calculater writing. What happens when you hover over 51773?